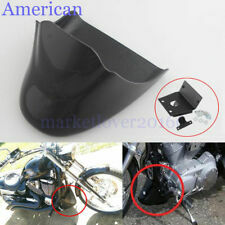 Package Includes:1X Harley Front Spoiler Cover+1X Mounting Bracket+Set of Mounting Accessories. 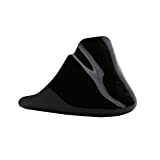 Package includes: 1X Front Spoiler Cover / 1X Mounting Bracket / 4X Mounting Screws. 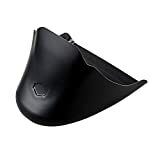 Fitment:For 2006-2017 Harley Dyna model (except FLD models) / Does not fit with engine guards / Does not fit California models equipped with evaporative emissions canister /Does not fit with Dyna Tool Roll P/N 91714-97A. Will not fit with Oil Cooler Kits. 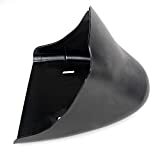 Made of high-quality super light ABS resin thermoplastic cover and metal bracket. 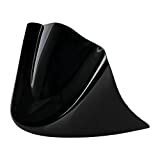 Front Spoiler Cover can prevent splash ups and protect your spoiler during riding. 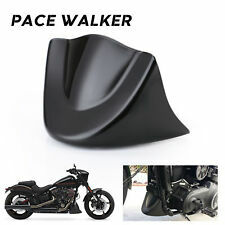 Fashion design with Glossy Black for your motorcycle. 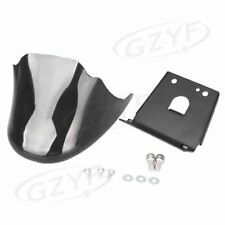 Package Includes: 1X Front Spoiler Cover + 1X Mounting Bracket + 4X Mounting Screws. Fitment: 2006-2017 Harley Dyna (except FLD models)/ Does not fit with engine guards. Fitment: Does not fit California models equipped with evaporative emissions canister/ Does not fit with Dyna Tool Roll P/N 91714-97A. Will not fit with Oil Cooler Kits. Made of High-Quality ABS Cover and Metal Bracket. Fashion design with Matte Black. 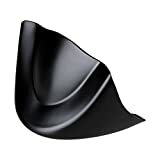 Prevent splash ups and protect your spoiler during riding. Mounting bracket and mounting screws are included. Direct replacement. Easy installation. Specifications: Specifications: Condition: 100% Brand New Package Includes: 1X Front Spoiler Cover 1X Mounting Bracket 4X Mounting Screws Size: As the picture shown Color: Matte Black Material: High-Quality ABS + Metal Bracket Weight: 1.23lb (560g) Features: Made of High-Quality ABS Cover and Metal Bracket Prevent splash ups and protect your spoiler during riding Fashion design with Matte Black Mounting bracket and mounting screws are included Direct replacement. 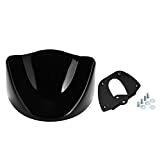 Easy installation Fitment: 2006-2017 Harley Dyna (except FLD models) Does not fit with engine guards Does not fit California models equipped with evaporative emissions canister. Does not fit with Dyna Tool Roll P/N 91714-97A. Will not fit with Oil Cooler Kits. * Note: * Please read all description & fitment before ordering the product. Condition: Aftermarket 101% brand New..
Material: ABS Plastic With Bracket..
Fitment: Fits Harley Davidson Sportster 883 XL1200 2004-2014 models (except 2015-later models with ABS)..
100% Brand New and aftermarket, compatible and interchangeable with original parts perfectly..
Fitments: Fits '06-later Dyna models (except FLD). Will fit with Chrome Voltage Regulator Cover P/N 74667-06..
Material: Using the injection-molded construction technology, made of high quality ABS plastic housing and steel mounting bracket, durable in usge, not easy to be cracked or be broke..
Package Included: 1 x Front Chin Spoiler Air Dam Fairing and hardwares for mounting. Easy to install, Not Installation with it.. PLEASE NOTE: Check the Fitments before payment.. Feature: 100% Brand New and aftermarket, compatible and interchangeable with original parts perfectly Using the injection-molded construction technology, made of high quality ABS plastic housing and steel mounting bracket, durable in usge, not easy to be cracked or be broke. 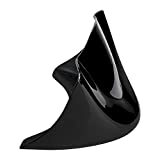 Cool Glossy black outside finish, add an amazing visual appeal, decorate your motorcycle perfectly Designed with a scooped shape to emphasize the long and lean body of your Dyna models Mounting hardwares are included , pre-drilled holes for easy installation. Specific Size is As Shown, please see more details from picture. 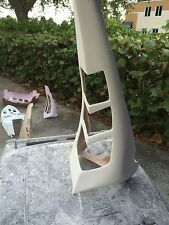 Fitment: Please check the size before payment Fits '06-later Dyna models (except FLD). 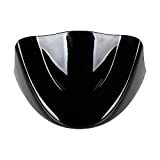 Will fit with Chrome Voltage Regulator Cover P/N 74667-06. Does not fit with engine guards. Does not fit California models equipped with evaporative emissions canister. Does not fit with Dyna Tool Roll P/N 91714-97A. Will not fit with Oil Cooler Kits. 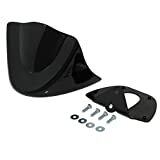 Package Included: 1x Front Chin Spoiler Air Dam Fairing and hardwares for mounting. Easy to install it, the Installation Instructions did not Included. Package contains: 1X Front Spoiler Cover + 1X Mounting Bracket + 4X Mounting Screws. Compatible with 2006-2017 Harley Dyna model (except FLD models). DO NOT FIT with Engine Guards, California models equipped with evaporative emissions canister/ Dyna Tool Roll P/N 91714-97A/ Oil Cooler Kits. 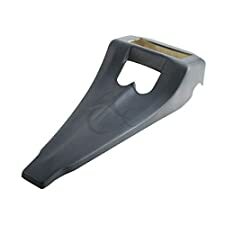 Front Spoiler Cover can Prevent Splash Up and Protect Your Spoiler when Riding. Produce with Injection-Molded Construction Technology for Durable in Usage, Not Easy to be Cracked or Broken. Fashion Design with Glossy Black Finished. 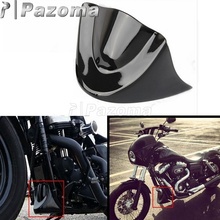 Fitment: For 2006-2017 Harley Dyna model (except FLD models). Does not fit with engine guards. Does not fit California models equipped with evaporation emissions canister. Does not fit with Dyna Tool Roll P/N 91714-97A. Will not fit with Oil Cooler Kits. Condition: Aftermarket 100% brand New..
Color: As the picture shown..
Easy to install. No Installation Instruction included..
Fitment: Harley Dyna StreetBob FatBob Wide Glide 2006-2017..